Today I found the time to do some testing. My “fresh” batch of collodion causes stripes on the plates, not all of them all as “bad” as the other, that’s what made it a bit awkward. But time to figure out what was causing it. At first I though it was the non- room temperature (I used collodion straight from the fridge, then I thought adding a little alcohol would do the trick and it did help in the beginning but the stripes returned again. Yesterday I added some ether / alcohol mix I still had in my fridge to my pouring batch and kept it at room temperature so today I would have the good stuff to work with. Another thing I noticed from the last shoot was that I poured 7 plates from my pouring bottle and it was empty. Wayyyy too fast, indicating the collodion was too thick, suggesting too little ether / alcohol. The batch poured / flowed much better today and the stripes were, except from a few minor ones, gone! I even tried a negative 8×10″ of clear glass I cut recently. The latter also being very interesting to show at the workshop and demos I am about to give. Mixed some fresh fixer and continued with the filtering of the varnish, that last bit taking up quite a bit of time; goes very slowly. Once done I’ll have some great stuff to be working with though, particularly smelling very nice! This entry was posted on April 3, 2011 by Contrastique. It was filed under Wet Plate Collodion-Process & Chemistry and was tagged with darlot, petzval, test, wet plate collodion. I have had a similar problem when the weather was particularly cold. It seems as though the developer doesn’t flow onto the exposed plate evenly. Another problem I have had is that my fingers warm the plate where I hold the plate when placing it into the developer, causing dark areas. Yeah, in cold water you should adjust the developer and the collodion. 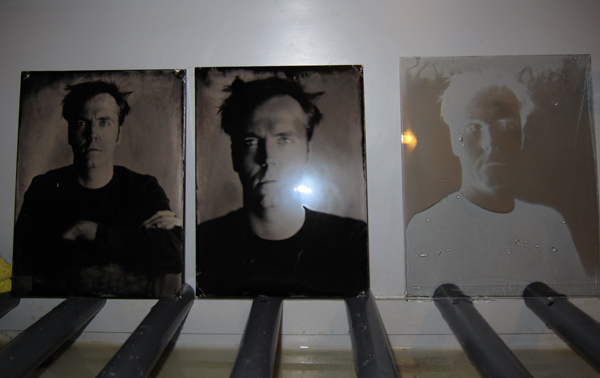 The collodion needs to have more ether than alcohol with cold water and more alcohol than ether with warm weather. The developer needs more alcohol with cold weather and more water with warm weather. If the collodion was really that thick, you must have noticed those white lines during fixing the plate. were they all gone when you stopped the fixing time ? I also use laboratory filters (Whatman 595 1/2) for my varnish because I didn’t like the coffee ones because of excessive clogging.